Dr. Alvin Weinberg was a nuclear pioneer who helped build the foundation that has maintained Oak Ridge’s position on the forefront of nuclear energy development. 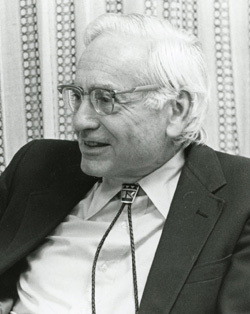 A native of Chicago, Weinberg’s influence on nuclear issues can be traced back to his days at the University of Chicago, where he received his B.S., M.S., and Ph.D. degrees in physics. Shortly after receiving his Ph.D., he joined a University of Chicago group that demonstrated that a controlled nuclear chain reaction could be achieved, thereby establishing the basis for development of the first nuclear reactor. He and his teammates designed and developed the Graphite Reactor at Oak Ridge and led the way for the production reactor at Hanford, which produced the plutonium that would ultimately be used for the atomic bomb dropped on Nagasaki, Japan to help end World War II. He moved to Oak Ridge, Tenn., in 1945 to work at Clinton Laboratories (later renamed Oak Ridge National Laboratory (ORNL), on the Manhattan Project and soon became director of the physics division. In 1955, he was named director of ORNL, a position he held for 18 years before retiring in 1973. As director of the lab, he played a central role in addressing the nation’s energy crisis during the 1970s. It was at this time Weinberg, along with Bell Laboratories President William Baker, conceived of the idea that allowing the highest levels of government access to systematic overall analysis of the energy problem might have spared the country the difficulties caused by the energy shortage. The Prospectus for the Institute for Energy Analysis (IEA) was issued in the fall of 1973, and the Atomic Energy Commission began to plan for the institute’s creation, including the designation of Oak Ridge Associated Universities (ORAU) as contractor for the IEA. Weinberg was named director of the IEA in 1974. Under his guidance, the IEA and ORAU developed an international reputation for examining broad questions of energy policy framed in economic and social perspectives, as well as in consideration of the latest technology. Additionally, under Weinberg, the IEA became a leader in the study of carbon dioxide in the atmosphere and the “greenhouse effect;” the Three Mile Island incident focused attention on IEA work on safe reactors. Weinberg retired from ORAU in 1985 and was named an ORAU Distinguished Fellow by the ORAU Board of Directors. In 1992, he was named chairman of the International Friendship Bell Committee, a project that commemorates Oak Ridge’s role in ending World War II and expresses hope for peace, friendship and understanding among the entire world’s people. Over his 65-year career, Weinberg was widely published and earned an extensive range of honors. Many of his early essays were published in a 1967 anthology titled, Reflections on Big Science. More recently, the book, The First Nuclear Era: The Life and Times of a Technological Fixer, published in 2001, features a collection of anecdotes and remembrances with added technical information to support his opinions. He was a recipient of the Atoms for Peace Award, the Harvey Prize, the Heinrich Award and the Fermi Award. He was a member of the National Academy of Sciences, the National Academy of Engineering, the American Academy of Arts and Sciences and the American Philosophical Society. He was also a Foreign Member of the Royal Netherlands Academy of Sciences. Weinberg died Oct. 18, 2006, at his home in Oak Ridge. He was 91.